The FootJoy Hydrolite Spiked Golf Shoes are always on the hunt for comfortable, high-performance golf shoes that we can afford without breaking out the piggy bank. Usually, all the convenience and comfort come at a considerable price. But we knew our requirements had met reality when FootJoy announced the Hydrolite line. These are handsome golf shoes that offer a lot of options in terms of feature set and colors. These are all-weather golf shoes with a well-executed design worth exploring further. The name of the FootJoy Hydrolite golf shoes tells all they claim to bring to the table. They are built to be lightweight and almost inconspicuous on your feet. They are styled to feel like a part of your feet. And they are waterproof. So you can literally wear them in any weather. Add to that the spiked sole, you can cover all terrains on the golf course in the rain too. The main advantage of FootJoy Hydrolite golf shoes is that hey do this all under a reasonable budget. And they have a number of options including spikeless versions. The leather design looks contemporary cool and is designed to be comfortable right out of the box. 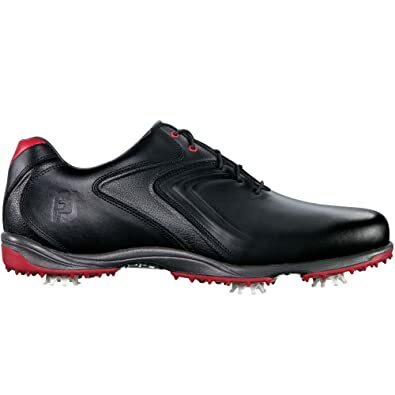 FootJoy Hydrolite golf shoes are perfect for any golfer who wants a sure-fire choice without doing too much research. They also work for folks on a tight budget. They give you high-performance at a small price. The FootJoy Hydrolite golf shoes sport full grain leather uppers. We didn’t expect such material at such price given all the features too. Full-grain leather is top-quality genuine leather which is flexible enough to support the natural movement of your feet but also durable. It can take the roughshod treatment without breaking down easily. I walked through the Idaho golf club course and spent hours and hours overcoming it. These shoes held up fine through the frustrating experience. With 2-5 hours on the golf course per round, this is the kind of performance you need. This is perhaps the most valuable feature of the FootJoy Hydrolite golf shoes. The leather uppers are not just for bragging rights, they are also watertight. FootJoy guarantees the waterproof performance for at least 2 years. It has held up so far for me in light rain and dewy grass. I haven’t exposed it to puddles for longer than 3-4 mins. Even waterproof shoes can’t prevent water leaks when submerged in water for longer periods of time. Waterproofing almost always comes at the cost of some ventilation. FootJoy Hydrolite golf shoes avoid that issue for the most part. My feet did sweat a little but not enough to be uncomfortably wet. Most of my teammates who tried theses shoes came back with dry neutral-smelling feet at the end of the rounds. The FootJoy Hydrolite golf shoes are commendably lightweight. When I first wore them, I compared them to the other spiked golf shoes I was using. The FootJoy felt better to walk on because of the low weight. Usually, the cleats also seem to weigh your feet down. But the Hydrolite felt more like an extension of my foot. These golf shoes are also more comfortable and less tiring over the long walk of the course because of the weight. ​One of my teammates complained that a cleat came off of his FootJoy Hydrolite golf shoes. This sort of problem is rare but the chances are there. It would be great to carry extra cleats during important games and tournaments. Every golfer appreciates the firm traction of golf shoes on the course. FootJoy Hydrolite use 6 hard plastic cleats on the sole to give you a firm ground. These are removable cleats so if they get damaged you can always replace them. The cleats are snowflake-shaped. They are a little different from the previous FootJoy cleats. You might have to search for them in a couple of shops. The DuraMax rubber sole of the FootJoy Hydrolite golf shoes are bendy and confirm to the movement of my feet. But they don’t wear away easily. And they provide proper arch support. After a 7 mile trek and standing through 4 hours, my feet felt fresh. I didn’t have to deal with any undue pressure or pain in my heels or arches through the hours of playing. We have reviewed the FootJoy Hydrolite Spiked version here. However, these also come in a spikeless version. If you find the spiked shoes difficult to walk in or they upset your balance, spikeless shoes are your antidote. They make you feel more stable. The traction is almost as good as the spiked shoes. Apart from these two models, there’s the spiked BOA model of the Hydrolite golf shoes. These use the special BOA lacing system that lets you tighten it by simply turning a knob at the back. These are your quick-slip shoes that let you suit up for the game fast. The FootJoy Hydrolite golf shoes are available in a number of colors. Depending on the model, you may find some extra colors too. The FootJoy Hydrolite spike golf shoes are being touted as one of the best golf shoes in 2017 online because of their talented feature-set in an affordable price. Most users exclaim how lightweight they are upon receiving them. My own teammates were thrilled. They didn’t expect the shoes to be durable but FootJoy has been holding strong till now. As far as the cons of the shoes go, there are hardly any major complaints. Some users have had trouble with the sizing. But we suspect they opted for the Medium shoe width instead of Extra Wide or didn’t check the sizing chart. In short, the verdict is in favor of the shoes. Golf shoes are more specialized compared to regular sport shoes. These have better support for long walks and strong swings. Golf shoes are made of premium materials. These have excellent ventilation for the hot days. Most importantly, golf shoes have spikes or lugs that dig into any terrain and give you a firm hold. Your feet must be steady while you swing the heavy club. They should also respond well to the way your feet twist during the swing. If you want a clean straight shot, you need the perfect grip on the golf course. Your feet shouldn’t move a centimeter if you don’t want them to. Spiked shoes provide excellent grip even in long grass and on wet courses. Spikeless shoes have caught up in traction domain but only few match spiked shoes in long rough and wet grass. Golf is all about the stance and the swing. Your golf shoes should provide you a solid ground to take the shot from without any pressure points. They should also respond to the natural movement of your feet instinctively. If you want to focus on your game, your golf shoes should feel like they are not there. A cushy sole that supports the heels is necessary and the shoes should press softly on the sides. It’s required of all-weather golf shoes that they be water-resistant. The golf course could be wet or you might walk in light rains on occasion. Not having wet socks is one less headache on the course. You will be walking 6-7 miles every time you use the golf shoes. It doesn’t help if the soles wear out quickly or the shoes come off at the seams. So make sure to triple-check the construction and look for buyer reviews explaining the comfort level over prolonged use. The FootJoy Hydrolite golf shoes bring water-resistance, commendable foot support, lightweight structure and spiked traction wrapped in an affordable budget. These have a low profile that blends in with all colors of attires. And these are pretty durable. We were striking out on either water-resistance or cleats at this price. The choice of BOA lacing system and the spikeless sole is also convenient. Not only do you get to live your golf dream without burning your pockets.